There was a time when the typical DVD software could only play movies, leaving the likes of Roxio and Nero to handle disc creation as a separate package. 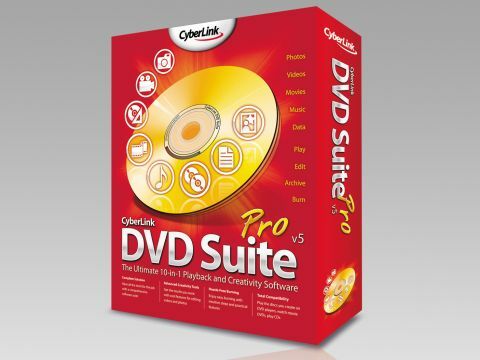 However, in this age of multimedia, things are changing, as CyberLink DVD Suite 5 (£35 inc. VAT) offers a comprehensive 10-in-1 answer to both DVD playback and disc creation. At the heart of package is CyberLink's impressive PowerDVD utility, which is a simple-to-use program for viewing your movies. The other programs are built around disc creation and fall into two different areas - those for data backup and storage and others for audio and video. As you would expect, support for High Definition media, such as Blu-ray, is a vital part of the package, but there is no support for HD DVD as yet. Power2Go allows you to create data discs simply by dragging files to the disc and, as with the similarly designed InstantBurn tool, you can use either a DVD or Blu-ray disc as you would a hard drive. PowerBackup, as the name suggests, allows you to make regular backups of your files. Once you've made a full backup, you only need to make incremental updates, storing up only those files that have changed, which saves time. You can even make a backup image of your laptop's hard drive, so should you have any problem later on, you can revert to a full working version. While these tools all work well, they open as separate utilities, rather than inside one larger interface, which can be rather frustrating, as you'll need to switch between tools. When it comes to video and audio disc creation, there are even more tools to get to grips with. Once again, while they work well, with no central interface you'll find yourself switching from window to window, which isa disappointment. PowerDirector is the main video tool and allows you to capture and edit footage in full widescreen and even output to HD MPEG 2 or MPEG 4, as well as the standard DivX or AVI formats. For those with less experience at editing, you can use the Magic Style and Fix tools to set the right balance and contrast and even set up better transitions using the built-in wizard. Overall, there is a lot to be impressed with here; it's just that it's hard to get the best out of it. At first we were overwhelmed with just how many tools there were for the money. This may be great value, but the interface isn't the most intuitive and needs a rethink if it's to be a serious threat to the likes of Roxio and its Creator series.